The Urban Politico: Twitter's IPO: To Buy or Not To Buy? I have to admit, I never really "got" Twitter. And by that I mean I never really understood the appeal of people distilling all of their thoughts down to 140 characters or less and repeating this process several times per minute while simultaneously keeping track of the millions of other people who are doing the same thing in real time. I guess for me it all boils down to an efficacy issue; by the time you "Tweet" whatever your thought was and apply the ubiquitous hashtag, 10,000 other Tweets have already been piled on top of your Tweet and pushed it so far down the wall that you'd have to scroll down for 30 minutes just to find it. Nevertheless, I do have to respect the fact that Twitter has taken its rightful place as an established icon among the social media elite. A business just isn't doing business these days unless it has both a Facebook and a Twitter page. Celebrities regularly use it to talk to their fans. And let's not forget our nation's elected officials who constantly Tweet their talking points (among other things *cough* Weinergate *cough*) to the American people on a daily basis. Yes indeed, it would appear that Twitter is here to stay. But does that make it a wise investment for people looking to expand their stock portfolio now that the social media giant has decided to sell its shares on the stock market? Ticker: TWTR. And don’t confuse it with the bankrupt electronics store Tweeter Inc., which formerly held that ticker. Again, Twitter won’t be available to buy on an exchange until Thursday. It will trade on NYSE. 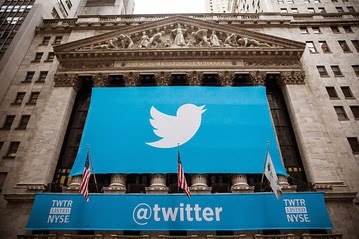 Who is selling: Twitter the company is selling all the shares in the offering and says the $2.1 billion will be put to general corporate uses. No current shareholders of Twitter are selling stock. Those insiders hold about 51.4% of the shares. Biggest holders: The biggest holders, their percentages and the value at the IPO price: Rizvi Traverse, 15.6%, $2.2 billion; Evan Williams, 10.4%, $1.5 billion; J.P. Morgan, 9%, $1.3 billion; Spark Capital, 6%, $843 million; Benchmark Capital, 5.8%, $821 million; Union Square Ventures, 5.1%, $724 million; DST Global, 4.4%, $617 million; Jack Dorsey, 4.3%, $610 million; Richard Costolo, 1.4%, $200 million. Lock-ups: The shares held by insiders are restricted from selling for a period after the IPO. According to the filing, up to 9.9 million shares held by employees who aren’t executives will be eligible for sale as early as Feb. 15. The shares held by executives and insiders are restricted for 180 days from Wednesday’s pricing. Users: Twitter has 231.7 million monthly-active users at the end of September, up 39% from the prior year. The breakdown includes 23% of users in the U.S. and 77% across the rest of the globe. These users tweet about 500 million times a day in aggregate. Mobile Use: The key metric shows that 76% of Twitter’s users accessed the service on a mobile device in the third quarter, up from 69% during the third quarter a year earlier. Revenue: Twitter’s revenue for the first nine months of 2013 was $422.2 million, double from the first nine months of 2012. The company gets 89% of that revenue from advertising and 11% of it from data licensing to the ecosystem built off of Twitter’s massive store of user data and stream-of-consciousness. Mobile Revenue: Twitter said that over 70% of its advertising revenue in the third quarter came from mobile devices, showing it can make money off of the growing turn to mobile. International revenue: Despite more than 77% of its users being international, Twitter made only 25% of its revenue outside the U.S. Twitter says it charges $2.58 per “timeline view” for an ad in the U.S. and only 36 cents per view outside the U.S.
Bottom Line: Losses pile up as far as one can see for Twitter. The company’s loss in the first nine months of 2013 nearly doubled to $133.9 million. Since the start of 2010, Twitter has lost nearly $409 million, 47% of the revenue it has brought in during that time. Don't invest in individual stocks. Especially don't invest in tech IPOs. This isn't tech advice, just widely accepted financial wisdom for normal, non-professional, non-gambling investors: Buy index funds and forget about picking. And, really, it's the first and the last reason for you to stay away from TWTR. If you're no expert, don't pit yourself against the experts. You don't understand Twitter. Few people do, really. It's telling that Twitter's IPO roadshow video begins with three of its co-founders, Evan Williams, Jack Dorsey and Biz Stone, expressing slack-jawed awe at the company's rise. Twitter is such a simple product that nobody quite expected it to take off as it did, and the ways in which people began using it were so innovative that they constantly surprised even its creators. Indeed, many of Twitter's signature functions, including @-replies and hashtags, were invented by users, not the company. But from a business perspective, Twitter's flexibility seems as much a blessing as a curse. Twitter is still a niche service, one experiencing solid but unspectacular user growth. The optimistic take on its user base is that Twitter just hasn't figured out a way to explain itself. As it sharpens its message to new users—see the "Discover Twitter" intro page it just launched— perhaps more people will realize that Twitter is right for them. Here's the trouble for any would-be investor: Nobody knows which of these takes is right, not even people who tweet all day, not even the folks who make Twitter. Whatever you think Twitter is, and whatever you think Twitter will be—it's all just a guess. Twitter's place in the advertising business isn't clear. In Web years Twitter isn't a very young invention, but as a company, it is a late bloomer. Only relatively recently has it morphed into a well-functioning business based on a key advertising product, the Promoted Tweet. Yet its business is plagued by questions for which we have no answers just yet: Do Twitter's ads "work"—do they reach enough people, do they alter purchase decisions, and are they becoming a standard part of advertisers' media buys? Can Twitter's business skyrocket if its user base doesn't? Will it constantly find itself losing out on ad deals to its behemoth rivals? But that doesn't change the fact that Twitter is a risk, a big one. If you bet on Twitter, you ought only go into it with the understanding that you don't know what will become of the company. You're walking into this deal nearly blind, because you have to, because Twitter is so young, so small, and so different that it's hard to know what to make of it. Sometimes such investments turn out to be huge. Other times you reach for the Maalox. Good luck.